Heading into the Memorial Day weekend, most box office analysts predicted that Disney's family-friendly adventure Pirates of the Carbbean: Dead Men Tell No Tales would have no trouble taking down the R-rated comedy Baywatch at the box office. The only question was how much would these Pirates beat the lifeguards by, and today we have our answer. Pirates of the Caribbean: Dead Men Tell No Tales easily took the top spot with $62.6 million over the three-day weekend and $77 million over the four-day holiday weekend. While it was certainly an easy win, it also proves that this franchise has lost some of its luster. Box Office Mojo reports that this pirate adventure opened in 4,276 theaters, pulling in a solid $18,018 per-screen average. While a $77 million opening would be huge for most movies, it is actually the second worst debut in Pirates franchise history, just behind the $46.6 million debut of the first movie, 2003's Pirates of the Caribbean: The Curse of the Black Pearl and the $90.1 million debut of the 2011 installment Pirates of the Caribbean: On Stranger Tides. 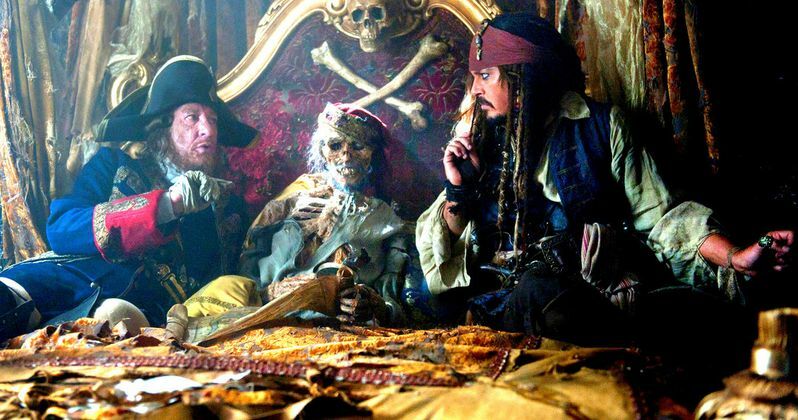 There has been talk that this may be the final adventure for Johnny Depp's Captain Jack Sparrow, and with the franchise taking a downward turn domestically, it may make sense to end the franchise now. However, the movie is still pulling in solid numbers internationally. Pirates of the Caribbean: Dead Men Tell No Tales pulled in $208.4 million from its international debut, for a worldwide total of $285.4 million, a figure which was at the high end of many box office analysts worldwide projections, claiming the movie would earn between $230 and $285 million worldwide in its opening weekend. The movie was produced under a massive $230 million budget, but if its trajectory is anything like On Stranger Tides, it will end up doing much better internationally than domestically. That movie only took in $241 million domestically, the lowest in franchise history, but it took in a whopping $804.6 million internationally for a worldwide tally of $1.04 billion, from a $250 million budget. The international tally was more than three-fourths (76.9%) of its global haul, so we'll have to wait and see if this pirate adventure can pull in similar numbers, even with a lower debut. Marvel's Guardians of the Galaxy Vol. 2 remained in second place this weekend with $25.1 million over the four-day frame, bringing its domestic tally up to $338.4 million. We reported yesterday that this superhero sequel has already surpassed the original Guardians of the Galaxy movie ($333.1 million) after just four weeks at the box office, and its $788.5 million global haul has also surpassed the original's $773.3 million take. With a competitive summer movie season ahead, it remains to be seen if these Marvel heroes will be able to surpass $1 billion at the box office. Regardless, this Guardians sequel proved this franchise is stronger than ever, with writer-director James Gunn currently writing the script for the third installment. Paramount's Baywatch opened in third place with an estimated $23 million, opening in 3,647 theaters and pulling in a $6,307 per-screen average. While it's certainly not a huge opening weekend, the R-rated comedy was produced under a $69 million budget, which pales in comparison to the whopping $230 million it cost to make Pirates of the Caribbean: Dead Men Tell No Tales. Still, Baywatch isn't getting as much help from overseas, opening in just a handful of global markets earning just $873,000 so far. The movie opens today in the U.K. and Ireland, with a number of markets debuting on June 1 and June 2, although it doesn't seem that this will open in China, the second biggest market in the world behind the U.S. The top 10 is rounded out by Alien: Covenant ($13.1 million), Everything, Everything ($7.3 million), Diary of a Wimpy Kid: The Long Haul ($5.8 million), Snatched ($4.8 million), King Arthur: Legend of the Sword ($4.1 million), The Boss Baby ($2.3 million) and Beauty and the Beast ($1.9 million). Also arriving in limited release is Broad Green's documentary Buena Vista Social Club: Adios, Screen Media's Drone, Parade Deck Films' The Here After, Indican's action film Jasmine and Abramorama's Long Strange Trip - The Untold Story of The Grateful Dead, although no box office data was released for any of those movies yet. Looking ahead to next weekend, Warner Bros. continues its DC Extended Universe (DCEU) with the highly-anticipated Wonder Woman, which will go up against 20th Century Fox's animated adventure Captain Underpants. Also opening in limited release will be Pantelion's comedy 3 Idiotas, IFC's comedy Band Aid, CBS Films' dramatic comedy Dean, Well Go USA's action film God of War, Purdie Distribution's drama Love, Kennedy, Instrum Int's comedy Opening Night, Samuel Goldwyn Films' foreign film Past Life, Entertainment Studios' sci-fi movie The Recall and Vertical Entertainment's crime drama Vincent N Roxxy. Take a look at the four-day box office estimates for this Memorial Day holiday weekend.